Over the centuries, peoples of many cultures settled on the land now known as Greece. Among the earliest peoples were the Minoans (muh«NOH»uhnz), who settled on the island of Crete, and the Mycenaeans (my»suh»NEE»uhnz), who settled on the Greek mainland. 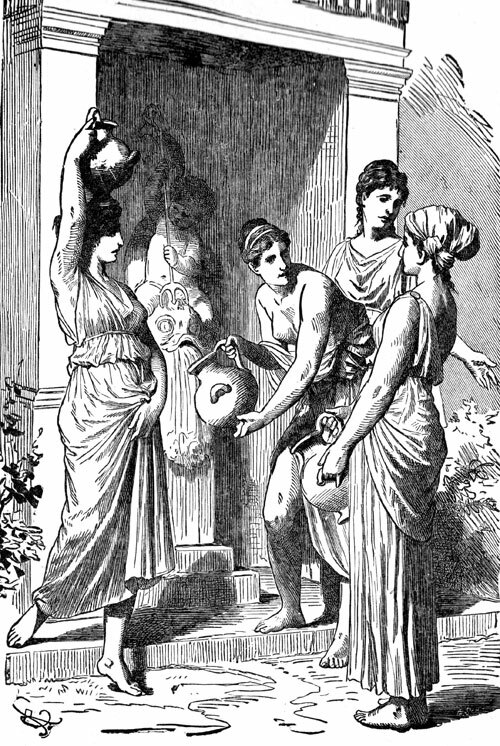 For centuries legends have told about the first people to live in and around Greece. Some of the tales may be based on truth. Others, however, may have come from the imaginations of those who first told the stories years ago. Today most of what we know about the Minoans and the Mycenaeans comes from the work of archaeologists. Their studies are based on the actual remains of the Minoan and Mycenaean civilizations. The island of Crete lies about 60 miles (97 km) south of the Peloponnesus. The Greek poet Homer described Crete as "a rich and lovely land, washed by the waves on every side." Today Crete is still much as Homer described it so many years ago. For centuries the people of Greece told stories of a long- lost civilization on the island of Crete. Experts, however, could find no proof of this ancient civilization. Then, at the beginning of the twentieth century, British archaeologist Arthur Evans announced an amazing discovery. He had found the ruins of an ancient kingdom. He called this kingdom the Minoan civilization, in honor of a legendary king of Crete called Minos (MY.nuhs). Today we still call the people of ancient Crete Minoans. For many years Minoans lived in small farming communities. As the population grew, so did the communities. Around 1900 B.C. the people of Crete began building palaces. These huge buildings were centers for governing and controlling the neighboring countryside. The palaces may also have been centers of religion. The palaces seemed like mazes, with many rooms and winding passages. Many houses were built around the palaces. Beyond the palaces and houses were small towns, villages, and farmland. The remains of four Minoan palaces have been uncovered. The largest, called Knossos (NAHS»uhs), stood at least three stories high. Knossos probably covered 185 acres of land. That is the size of 20 football fields. Archaeologists believe that as many as 12,000 people lived in and around this palace. Beautiful paintings showing peaceful scenes decorated the walls of the ancient palaces. 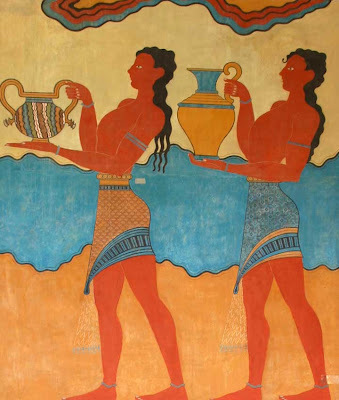 The paintings tell much about the Minoans. These works of art show that the Minoans loved dancing, music, and sports. In many of the paintings,both women and men have long, flowing hair and wear gold jewelry. The wall paintings also show that religion was an important part of Minoan life. The paintings and other archaeological evidence also suggest that the Minoans were expert sailors and sea traders. They traded with peoples in ancient Africa, Asia, and Europe. Egypt, in Africa, and Syria, in southwestern Asia, were just two of their many trading partners. 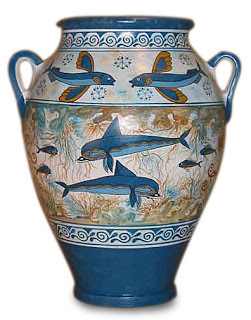 Minoan trading ships carried olive oil, wine, wool, pottery, and other goods from Crete to ports across the seas. The ships returned with supplies of copper, tin, and gold. The people of Crete mixed copper and tin to form the metal bronze. Using bronze, they crafted bowls, as axes, and other objects. The Minoans developed a system of writing as a way of keeping records. Unfortunately, some Minoan writings may have been destroyed by a fire that swept through the kingdom in about 1370 B.C. Only records that were written on clay tablets remain. So far, no one has been able to translate the writing on these tablets. Once experts learn how to read this early Minoan writing, we may learn more about the way of life of the ancient Minoans. No one knows for sure what caused the decline of Minoan civilization. Some historians believe that a large fire burning out of control may have caused the civilization's end. Others believe that a powerful earthquake struck the island. Still others think that invaders from the Greek mainland stopped the growth of Minoan civilization. What were Minoan palaces like?